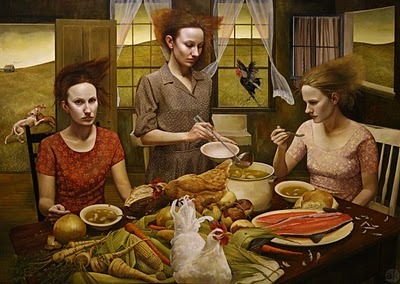 Andrea Kowch: Dream Fields, is on-view at the Muskegon Museum of Art through October 27. The exhibition includes twelve large paintings and several preliminary studies, depicting women assuming unremarkable activities, in spare prairie landscapes, or shabby farmhouse interiors. Kowch’s painting Sojourn was exhibitied at the Grand Rapids Art Museum in conjunction with ArtPrize 2012. Sojourn (2011) features two young women in a late summer landscape, seemingly unphased by what appears to be a pending storm. Even as the wind whips around them, they are completely engrossed in the task of…catching butterflies? Whatever the specific activity, their determined expressions and deliberate movement implies that it is of some importance. Sojourn manages, just barely to escape becoming a sentimental metaphor for the transition from adolescence to adulthood. The eleven other paintings included in this exhibition, generally steer clear of such precarious kitschiness. Kowch’s training as an illustrator is apparent, but she includes elements that create enough formal and narrative tension, that they hold-up as compelling images in their own right. Technically the works are surprising, with areas of high detail contrasted with smaller more painterly or scumbled effects. Given their similarities to the works of Andrew Wyeth (the setting, palette, and level of detail), one expects them to be tempera, and smaller in scale, but they are acrylic with an overglaze that imparts a sheen that resembles the surface of oil paintings. Animated garments and hair suggest psychological intensity, and act as a foil to the frozen gestures and placid expressions of Kowch’s unidealized protagonists. The dilapidated settings and dated clothing situates the images in a place that is temporally uncertain. Windswept frizzled hair is a common feature in this series, and is another effective means to keep the viewer from being able to place them in a particular era. Kowch’s work is described as magical realism, a term typically used for literary works that seamlessly incorporate fantastical elements into an otherwise mundane storyline (like the television series Wonderfalls, or Twin Peaks). Kowch has indicated that Northern Renaissance portraits are a source of influence, but clearly she owes something to Mannerism and the Surrealists. Kowch’s frequent allusions to domestic spaces and activities, are reminiscent of compositions by Dorothea Tanning or Remedios Varo. The unflinching gaze, and affected gestures of Kowch’s subjects also suggest the Mannerist portraits of Agnolo Bronzino, or Jacopo da Pontormo. These characters are not Paul Delvaux’s somnambulant nudes, or George Tooker’s anxious subway passengers–encountering these paintings, one feels like an intruder, or an unwanted guest, compelled to apologize for interrupting. It may seem far afield, but the Muskegon Museum of Art is a gem of a museum. Every curated exhibition I have seen at the Muskegon Museum has been very good. Their small permanent collection includes works by a coterie of noteworthy artists including William Hogarth, Lucas Cranach, Henry Ossawa Tanner, Edward Hopper, and Robert Henri. Admission is reasonable, and parking is free. 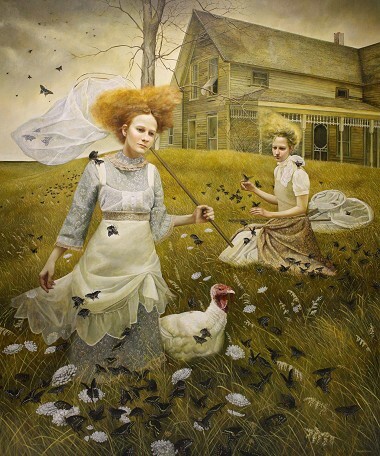 Andrea Kowch: Dream Fields August 15 through October 27, 2013.